Mt. 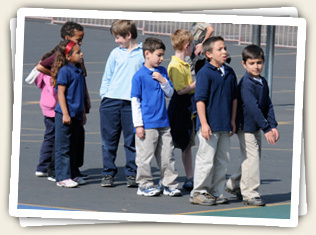 Helix Academy students waiting patiently for their turn at Four-Square--a "Peaceful Playground" moment. The purpose of the Mt. Helix Academy student uniform policy is to promote an effective learning environment for all students. Desirable and optional are Mt. Helix Academy logos that are available from Lands’ End and French Toast. Lands’ End School uniforms are also available at Sears. Mt. Helix Academy school source code: QS5EKQU. Use code at checkout. 4% of net online sales are donated back to Mt. Helix Academy. French Toast Official School Wear is also available at Target, Sears, and Burlington Coat Factory. Every Friday is “School Spirit Day” and, on Fridays only, T-shirts with the Mt. Helix Academy logo and blue jeans may be worn. Jeans must be solid color, without ornamentation, in good condition, and they must fit appropriately. Torn, sagging, or revealing jeans are not permitted. Matters of dress, jewelry, make-up, hair color and style, and so on not specifically addressed by the Mt. Helix Academy uniform policy will be permitted or not permitted on campus as decided by the Director of Mt. Helix Academy, whose decision(s) will be based on the degree to which the Director believes that the style or accessory in question is disruptive to student safety or the learning environment at the school. If a student violates the school’s uniform policy or arrives at school in a manner of dress deemed inappropriate by the Director or designee, the parent or guardian will be notified. If a second offense occurs, the student will be required to change attire before being allowed in the classroom, or, if this is not possible, the student will be sent home. Hats may be worn on the playground only. Hats may not be worn inside any school building. Sunglasses may be worn on the playground only. Sunglasses may not be worn inside any school building.